LAUSANNE, Switzerland May 31, 2016 – The World Baseball Softball Confederation today announced the official competition schedule for the WBSC U-15 Baseball World Cup 2016, which will be staged from 29 July to 7 August in Iwaki, Japan. Over the course of 10 days, a total of 50 National Team games will be contested across Iwaki Green, Nambu and Taira stadiums, with a 30-game Opening Round launching the 2016 international youth baseball flagship event. All 12 nations of the III WBSC U-15 Baseball World Cup will begin on the path “For Title of World Champion” on Friday, 29 July, and will have to compete in a challenging five-games-in-five-days group stage to start the tournament (29 July to 2 August). National Team rosters will be able to carry the countries’ top 20 players (born between 2001-2003) to Iwaki. The length of each game will be the regulation nine-innings. The official tournament microsite of the WBSC U-15 Baseball World Cup has been launched in five languages (English, Japanese, Korean, Spanish and Traditional Chinese). Defending U-15 world champions/world No. 5 Cuba and world no. 20 Colombia will meet on day one. It is the first time the South American nation has qualified into the U-15 Baseball World Cup. Host/world No. 1 Samurai Japan will open against world No. 13 Australia. Japan finished seventh at the 18-nation WBSC U-15 Baseball World Cup 2014 in Mazatlán, Mexico, while the Oceania representative finished 10th. World No. 4 South Korea versus No. 16 Czech Republic will be the official Game 1 opener. It will be the first time the South Korean National Team will be on the U-15 pinnacle stage. European representative Czech Republic finished 13th in 2014. World No. 2 United States versus world No. 3 Chinese Taipei will be among the most anticipated games of day one. The U.S. National Team finished second in Mazatlán, while Chinese Taipei finished fourth. World No. 6 Venezuela and world No. 7 Mexico will be each other’s first opponent. Venezuela captured the bronze medal in 2014, while Mexico finished fifth. World No. 17 Panama and world No. 30 New Zealand will meet on day one. Panama advanced to the Super Round in 2014 and finished sixth overall, while New Zealand finished 15th in the nation’s debut on the U-15 world stage. Following the Opening Round, the top three nations from Group A will face the top three nations from Group B in a nine-game Super Round, which will run from 4-6 August. A nine-game Consolation Round will be staged alongside the Super Round to determine 7th to 12th place in the final standings of the III WBSC U-15 Baseball World Cup 2016. 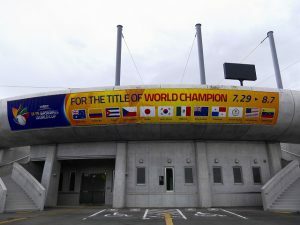 The top two nations at the conclusion of the Super Round will play in the world title game (Game 50) on Sunday, 7 August, at the 30,000-seat Iwaki Green Stadium, while the bronze medal match (Game 49) will take place ahead of the finale. The winning nation of the WBSC U-15 Baseball World Cup will be awarded 440 world ranking points.